We are smack bang in the middle of an epic Presidential race, made all the more formidable with the prospect of America electing its first female president in Hillary Clinton. With only 2 primary races voted on so far (Iowa and New Hampshire at the time of publishing this article) there is still plenty of time left for speculation. But with Hillary Clinton becoming the first woman in US history to win an Iowa democratic primary (despite losing New Hampshire by double digits a week later to Senator Bernie Sanders) it’s clear the former Secretary of State during President Obama’s first term is determined to make her second presidential bid go all the way to the White House. While we eagerly wait to see how this historical (for a number of reasons) presidential race unfolds in real life, you might be interested to see how it would play out in a fictional setting. 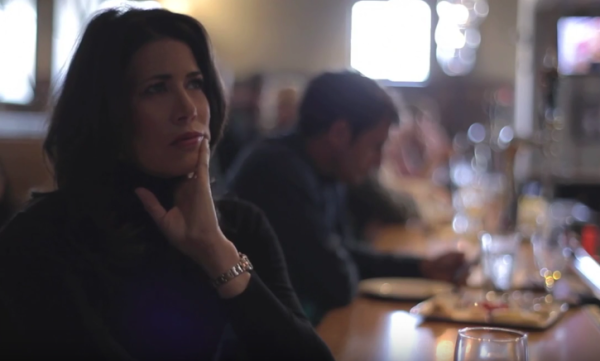 ‘Courting Des Moines’ is the feature length film from director Brent Roske, which follows the story of a passionate and determined Congresswoman running to be the first female US president. Dogged by political scandal (think Hillary’s Benghazi or email-gate) she must first win the crucial Iowa caucuses in order to be seen by the public as a serious contender. Brent Roske is a writer producer who moved from Hollywood to Iowa where he hosts a daily political show. 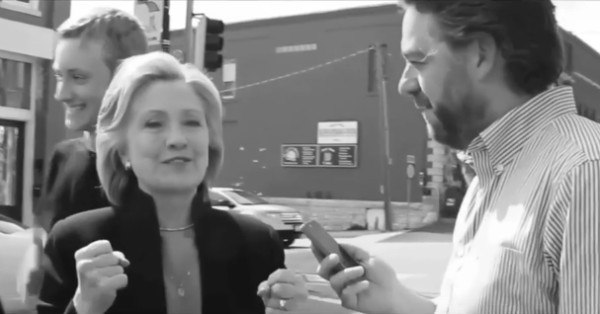 Throughout the film, we see inter-cut footage of Brent interviewing actual candidates such as Hillary Clinton, Bernie Sanders and Donald Trump, in a way that adds a layer of urgency to the story. While Samantha Clemons, played by former ‘West Wing’ actress Melissa Fitzgerald, must battle through scandal, gender-criticism and an unrelenting pressure to appeal to the predominantly white, Evangelical Iowans, her campaign manager Kelli Brown, played by newcomer Catherine Urbanek, leaves her job as a lawyer to come alongside a woman who could change the course of American politics forever. To find out more about this art imitating life film, we spoke to Catherine Urbanek about her role in ‘Courting Des Moines’, women in politics, and the significance of timing in this feature being released. Tell us about your character in ‘Courting Des Moines’? 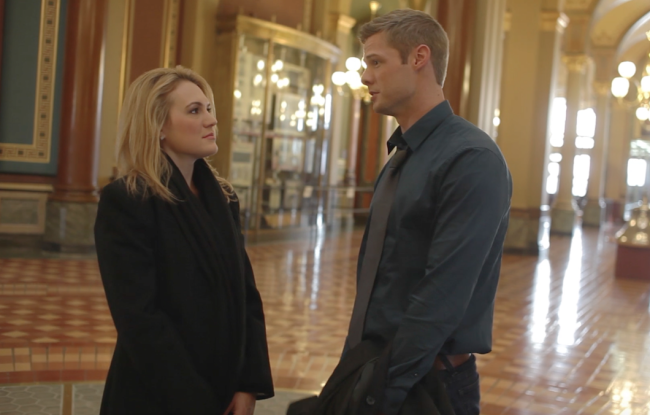 I play Kelli Brown, a young lawyer who works for her father, State Representative Tom Brown. Kelli, like most of those born and bred in Des Moines, has been surrounded by politics her whole life. She is a passionate, driven young woman and a patriot. Samantha Clemons, played by the wonderful Melissa Fitzgerald, hires Kelli to run her Iowa campaign for president. This film is about a woman running to be the first female president of the United States, which runs directly parallel to what is happening with Hillary Clinton’s presidential campaign right now. How do you think that will add to the intrigue around ‘Courting Des Moines’? It’s interesting because while there is certainly a parallel between the fictional Samantha Clemons and Hillary Clinton, Samantha is a one-term congresswoman from the state of California, while Hillary Clinton has much broader experience. 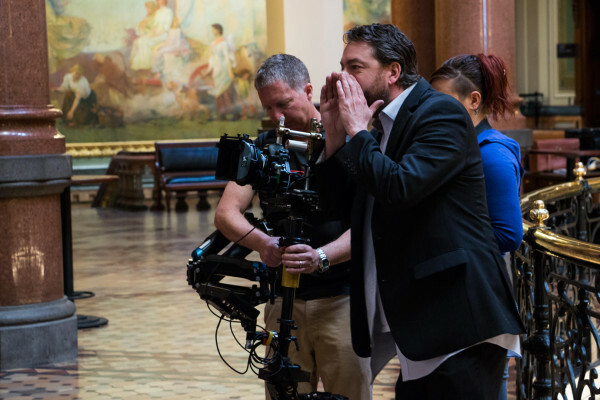 I’m glad Brent Roske, the writer/director of ‘Courting Des Moines’, chose to center his story around a woman running for president because it’s a statement reflective on the rise of female politicians and their power in this country. In 2008, we had Sarah Palin as a VP candidate. In 2012, we had Michelle Bachmann as a contender for the White House. In 2016, we have Hillary Clinton and we had Carly Fiorina. Never before in American history have so many women been running for the most powerful job in the country, and are serious contenders. It’s an incredibly exciting achievement in the women’s movement and I’m glad this film can share that spirit. Throughout the fictional story line, we get to see real footage of 2016 Presidential candidates like Hillary Clinton, Donald Trump and more. Why was this type of footage included? Brent’s script is unique in that it blends fiction and reality. Having politicians like Bernie Sanders, Hillary Clinton and Ted Cruz in the movie contributes to the authenticity of the story. And it’s also cool because this film is almost part documentary in its coverage of the current election cycle. You are appearing alongside ‘West Wing’ actress Melissa Fitzgerald who is certainly no stranger to political drama on screen. What was it like working with her? I loved working with Melissa Fitzgerald. She has such a warm and engaging energy. If she actually did run for president, I would probably vote for her! Have you been keeping up with the real life political story lines after being in this film? Absolutely. Prior to filming, I watched the Netflix documentary ‘Caucus’ and I read ‘Game Change’ by John Heilemann and Mark Halperin. Both were extremely insightful. I’ve definitely become more politically aware since working on this film. There is an incredible amount of sexism directed at Hillary Clinton’s way, and plenty of criticism reserved for her because of her gender that male candidates don’t get. How do you hope this film will seek to break down some of that gender bias, or at least expose it more? There is actually a scene in our movie where Samantha’s gender is used in a derogatory fashion against her by an opposing candidate. In the film, the response is outrage. So much so, the other candidate drops dramatically in the polls. I think that our society has become more supportive of women in positions of political power. Sexism is still present and there are those who will continue to act in a sexist fashion, but at the same time you have an equal number of the population who do not think that way. Despite the sexism that exists in our society, Hillary Clinton is still a powerful contender for the presidency of the United States. If sexism were a dominating element of our culture, she wouldn’t be. We still have a ways to go, but the progress is evident. As an up-and-coming actress in Hollywood what are the types of roles you ideally see yourself playing in the future?